The graphs could easily be created with the help of the rrdcgi program, which is in the rrdtool package. Creation is then only done on demand to save CPU cycles, you have to create some CGI scripts with special RRD:: tags, which are interpreted by rrdcgi. For details see the manpages of rrdcgi and rrdgraph. <INPUT NAME=period TYPE=RADIO VALUE=1year> Yearly. Of course you have to adjust this to your needs. To further ease the handling of the Flexnet system and the users who need to lease a license to do their work, another CGI script was created. 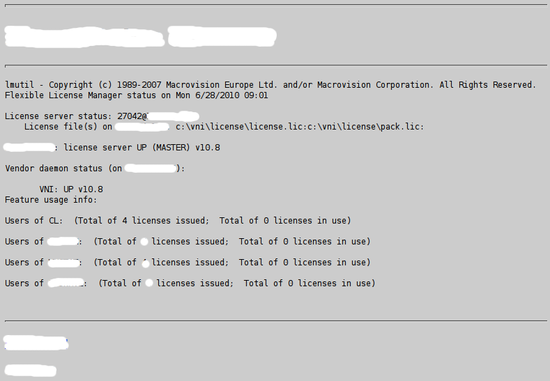 It is used to show who has leased how much licenses, it is only the output of "lmutil lmstat -a", but without logging in into a system where lmutil is installed. But be aware, this may collide with privacy protection in your enterprise, because personal informations are free accessible. So you may have to protect running this script with some authentication mechanism, but this topic is not covered in this tutorial. So you can select one of several products simply by supplying a "command line parameter" to the CGI script. By supplying a script like this one to the users of products where available licenses tend to be nearly maxed out all the time, it is easy that the users handle their issues regarding license usage among themselves, and there is no need for the administrator to be involved at all ;-).